FarmgirlCyn: CHECK OUT THESE BUNS! A couple of weeks ago I was invited by my neighbor/good friend Michelle to come over and have a lesson in bread/bun making. She has an awesome grain mill for grinding her own flour, and a Bosch mixer thingy, that can knead, I don't know, about 6 loaves of bread at a time. I don't have anything near that powerful, but I DO have a nice, sturdy Kitchenaid mixer which will knead a couple loaves at a time. Which suits me just fine as there is only 3 of us at our house, as opposed to 10 of them at Michelle's house. She KNEADS (get it?) to make that much bread at once!!! She sent me home with nearly a dozen buns which we ate that night with our grassfed burgers. She graciously passed on the recipe which I am now passing on to you! Ooh....go back into her archives a couple of weeks and see her demo/video 3 different ways to making your own mayo! No excuses NOT to make your own after you see what she does! Mix until moistened. Let rise( sponging) in bowl until it reaches the top of the bowl. Add enough whole wheat flour until the dough pulls away slightly from the side of the bowl. I think mine took another cup of wheat flour. Add a bit more water if it seems too dry. Knead 5-8 minutes, depending on the texture of the dough. Using olive oil, spread a thin layer on counter....laying dough onto oil. Divide dough in 12 pieces, oiling your hands when dough becomes too sticky to work with. Bake for 20 min. at 400F until golden brown. Watch carefully! These are now another item I do not ever have to buy from the grocers again. And did you check the list of ingredients? Just goodness through and through. Enjoy your weekend and give all those fathers/daddies an extra big hug! making buns has been on my to do list for awhile. I have a rye hamburger bun recipe from Mother Earth News that I've been wanting to try. These look good for regular buns, though. I so wish I had a grain mill and/or a more powerful KitchenAid. My poor little model can barely knead through two loaves. It protests but does eventually get the job done. The Bosch's are nice indeed...but I have a Kitchen Aid mixer to do mine too. I love making ww bread...but haven't done so in awhile. 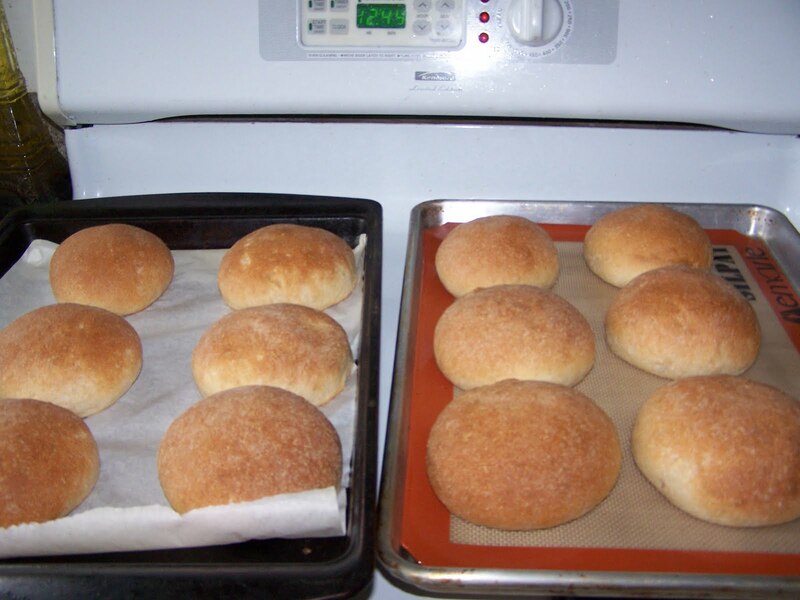 Homemade hamburger buns are great. Those look terrific! What another great way to feed our families health good stuff! Great looking buns! I'm saving the recipe to try. There's nothing like home made bread. I have to fight feelings of inadequacy whenever I see posts like this. I miss cooking and baking so much! I wish I could spend more time in the kitchen honing my skills and creating yummy things. I'm really curious about what the vinegar does. I've never seen a bread recipe with vinegar. I do have a wheat bread recipe for a small amount of lemon juice in it. Six loaves is a lot. Those are the best lookin' buns I've ever seen! happy Father's day to your husband! love the sidebar pics and all the great info too! YUM! They sure look delicious! Hope you're keeping well - are you recovered fully from your op? Your buns look favaloso!! So glad they turned out. we make hot dog buns out of them too. how do you get to be certified organic? Those are gorgeous! Someone was just asking me about a recipe for these a couple of weeks ago. I wish I could remember who so I could direct them here! Hopefully, it will come back to me. In the meantime, we'll definitely have to give these a try! Thanks for passing it along. 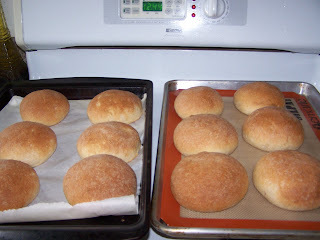 We make our own hamburger buns too- my recipe is a little different but they turn out great! Yours look fabulous! How could you Possibly forget to brush with butter?! I mean, you were eating one just as it came out of the oven, yes??? Mercy, sounds like you could use some help on baking day. Call me when the next batch comes out of the oven, k? I don't think I have ever thought of making home-made hamburger buns. I gotta give them a try!I also will check out the mayo demo. I have way too many farm fresh eggs not to be making my own mayo. As always I am delighted to have one of your recipes, and in this case two recipes I read your last post, and the chicken stir fry looks so yummy, and I am for quick dinners in this heat wave. Thanks for sharing. You have one of the most inspiring blog here in blogland, always so helpful, and encouraging. What a joy to know you.